One very high-profile Ladbrokes customer has cashed out his 5000/1 bet on Leicester to win the Premier League but the majority of the bookmaker’s Twitter followers wouldn’t be so hasty. Earlier today we broke the news that an anonymous punter had settled for a £1,100 windfall having staked just £1 on the Foxes to top the table. 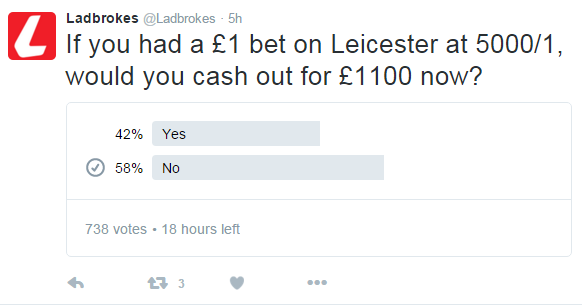 However, when we posed the question “If you had a £1 bet on Leicester at 5000/1, would you cash out for £1110 now?’ the majority said they would not. Or to be more precise, 58 per cent of voters would let the bet ride. The Foxes fanatic in question had this to say when speaking to us this afternoon: “Over a grand is too good an offer to turn down and it will go towards trains and tickets to follow Leicester chase the dream in the title run in” he said. Fair play and for those of you with sharp arithmetic you’ll note that a none too shabby 42 per cent agreed with the supporter’s sentiment. Looking to have a bet on the desitnation of this year’s title? We’re TOP PRICE on Leicester to win the Premier League until midday Sunday 14 February! And don’t forget to have your say in the comments section below or via @Ladbrokes!